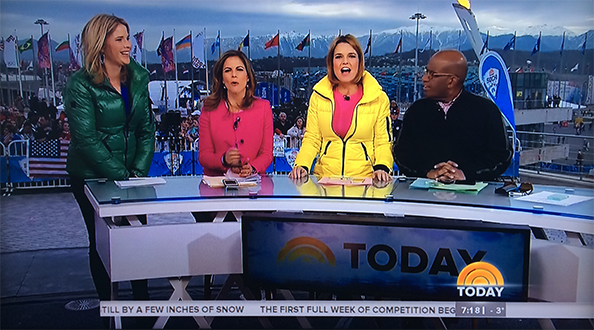 NBC’s “Today Show” is originating from Sochi’s Olympic Park using its half circle shaped indoor-outdoor temporary studio structure. 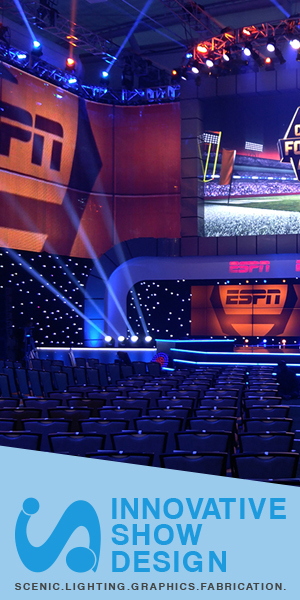 The studio, which features sliding glass panels that create a curved wall that can be opened, has been used around the world, mainly during Olympics coverage. It was also used back in New York City during the summer of 2006 while Studio 1A underwent a renovation, when the show originated from outdoors on Rockefeller Plaza. Behind the anchor desk is a sweeping view of Olympics facilities along with the mountain ranges surrounding the city. The Olympic Cauldron, meanwhile, takes center stage directly behind the anchors. 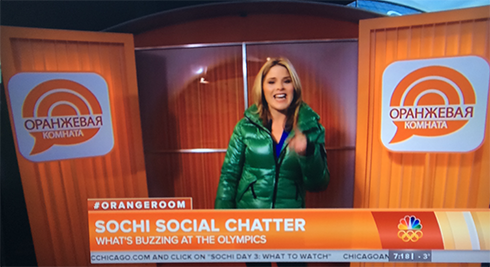 Off to the camera left side of the anchor desk is the “Oранжевый Komahata” — the Russian version of the Orange Room. The Oранжевый Komahata area mimics its New York City counterpart with vertical design elements found in two vertical panels on either side of a glass wall backed with an orange textured background. Behind the anchor desk, down the flight of curved stairs, is an open area that’s used for standing interviews and other segments. This area is surrounded by a fence that allows spectators to watch the show. 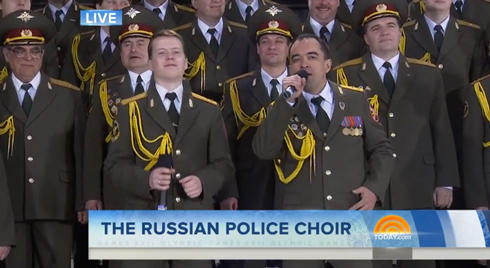 The Today Show’s graphics, meanwhile, have been recolored blue and have subtle textures and text added to them.